Chiropractic is alternative medicine specializing in the musculoskeletal system. Chiropractors help patients with back pain, neck pain, joint pain, and headaches. They practice hands-on, drug-free methods of treatment. You can start your path toward a chiropractic degree at Wayne State by studying biology, chemistry, psychology, and physiology. Then you’ll be ready for a specialized program at a professional chiropractic school. After three years at Wayne State, you can spend your last year at one of the following schools, with whom WSC has agreements: Palmer College of Chiropractic, Northwestern College of Chiropractic, Cleveland Chiropractic College, or Logan College of Chiropractic. 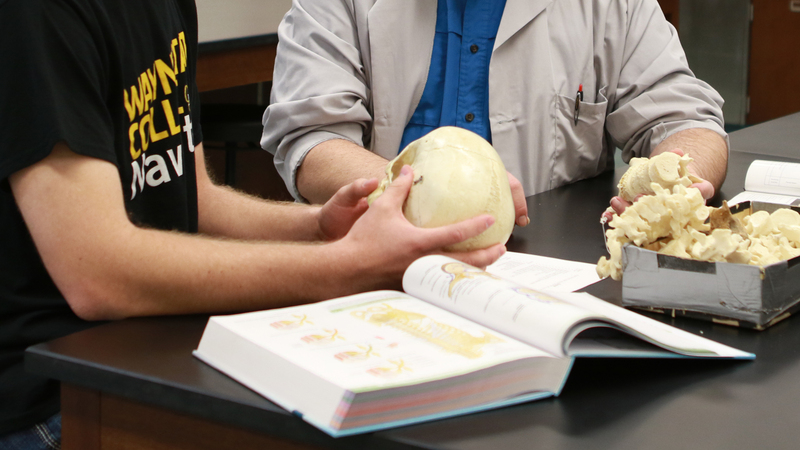 After graduating from WSC, you’ll be prepared to go to graduate school to earn your chiropractic degree. Degrees offered: You will spend the first three years at Wayne State College and your last year at an affiliate chiropractic school. After your last year, all credits will transfer back to WSC, and you will graduate with your B.S. in life sciences from WSC. In addition to having the region’s most affordable tuition, we offer thousands of dollars in scholarships every year. Learn more about scholarships and aid for your chiropractic studies in at Wayne State.